In a headquarters as large as that of the ASF, top direction was necessarily a collective enterprise. Yet General Somervell was able to impress the force of his own personality upon his staff and throughout the command to a remarkable degree. To be sure, there was no uniform response to that personality. There were individuals who were resentful of or even hostile to General Somervell's leadership. Yet most of his staff were intensely loyal to him, and faithful communicants of his purposes. In between these two groups were the great bulk of ASF personnel who in various ways received some indication of the drive of Somervell's personality and were, perhaps unknowingly, affected by it. in war production. On the other hand, as already noted, when the Operations Division of the War Department General Staff seemed to lag somewhat in providing strategic guideposts to the ASF, Somervell was by no means averse to providing the missing direction for himself. Staff in July 1943 as the Special Planning Division, General Somervell assigned ASF responsibility in this field to the Director of Plans and Operations.4 This arrangement was formalized in April 1944 by the creation of the position of Deputy Director for Demobilization.5 From this time on, redeployment planning received major attention throughout the Army Service Forces. A special report was devised on a monthly basis to indicate the kinds of demobilization plans being prepared, the staff agencies primarily responsible for preparation of these plans, and the status in the preparation of a fully approved plan for each activity. for the fiscal year 1944. it ranged from the preparation of modernized separation procedures, to a program for modernization of industrial plants to be used after the war; from transportation schedules to move three million men to the Pacific, to a point scheme for determining eligibility for individual release from the Army; from a large-scale program for general and vocational education for soldiers in Europe awaiting transportation home, to proposals for postwar organization of the Army. Closely allied to his faith in advanced planning of operations was General Somervell's abiding sense of urgency. Much as he disliked improvisation, even more was he intolerant of hesitancy and complacency. Wartime, of course, was a period of crisis. A nation which began its military mobilization late and had immense obligations to fulfill could not afford the luxury of leisure. General Somervell's natural temperament was admirably attuned to the needs of the time. Early in the war Somervell gave his whole command a slogan: "In an emergency any intelligent quick action is better than a delay in search of the ideal." These words were printed on a card and widely distributed. They were often invoked as an exhortation to desirable behavior. On one occasion, Somervell told a meeting it seemed to him that too many Army officers were still living in a "muzzle-loading era" and failed to realize that modern warfare was a "fast-moving job." At a conference of service commanders in Chicago in July 1943, General Somervell emphasized his criticism of red tape by reading a letter which became famous in the War Department. Medical Inspector's Office, Sta. Hosp., Robins Field, Warner Robins, Ga., June 12, 1943. To: Medical Supply Officer, Sta. Hosp., Robins Field, Warner Robins, Ga.
1. Following telephone information from your office that you were unable to issue carbon disulphide for use in this office in ant control, and following receipt of your letter listing insect repellents furnished by your office, request was made of Quartermaster for carbon disulphide for use by this office in ant control. We were informed by Quartermaster that they could issue such preparation if the ant to be exterminated was in the building. If it was outside of the building, the issue of such preparation properly should come from Engineering. It is difficult to determine the intentions of the ants we are attempting to exterminate-some live inside and wander outside for food, while some live outside and forage inside for food. It is a rather difficult problem to determine which ant comes from without and is what might be called an Engineering ant, and which ant comes from within and is what would be a Quartermaster ant. Some of our ants appear to be going in circles and others are apparently wandering at random with no thought of destination-such ant tactics are very confusing and could result in a Quartermaster ant being exterminated by an Engineering poison or an Engineering ant being exterminated by a Quartermaster poison which would be contrary to the letter of regulations and would probably lead to extensive investigation and lengthy letters of explanation. General Somervell's invariable prescription for cutting red tape was common sense. He told commanding generals of service commands at the very first meeting in 1942: "Use common sense. In other words, I am just not going to have the issue of necessary supplies and equipment delayed because some fellow somewhere has not signed some piece of paper. We must get these supplies in the hands of the troops when they are wanted, and you must see that that is done." 11 Somervell liked to express a sense of urgency by setting deadlines. If a job was important enough to start, it was important enough to finish on some kind of schedule. In a memorandum to General Clay in August 1942, Somervell cautioned that additional personnel, even of high quality, would not solve the production problems which constituted "the present major effort" of the Army Service Forces. He urged General Clay to do two things: (1) to review assignments of functions and redefine them where necessary, and (2) to give "a series of definite directives to your division directors, outlining the objectives which you expect them to attain. Wherever possible, I should like to have deadlines fixed for each of these objectives." 12 This was not an isolated kind of instruction. It was a general practice. Deadlines constantly urged key individuals in the ASF to keep moving and to get their work done as soon as, or sooner than, possible. In the summer of 1944 General Somervell was greatly concerned about what he sensed to be a growing national complacency based on the feeling that the war was practically over. Mr. Nelson of the WPB, as has been noted, was talking about reconversion. ASF deliveries were declining and manufacturers were reporting increased difficulty in obtaining and retaining the necessary labor force. How could the continuing needs of the day be dramatized, how could a sense of urgency once more be instilled, first throughout the ASF and then throughout the nation? General Somervell worried about the problem for several days, and then personally wrote out a brief order. The workday throughout the command was to be lengthened by one hour.14 Officially, the War Department at this time had an eight-hour day, and a forty-eight-hour week. In practice many, if not all, offices used considerable overtime. But the order was nonetheless greeted by some grumbling, and a good deal of adjustment in working arrangements and transportation schedules followed.15 On 1 August 1944 General Somervell issued a public statement explaining the need for the increased working day.16 He spoke of "serious concern during the last few months over the lack of progress in disposing of a number of pressing problems." He mentioned shortages in the deliveries of 320 vital categories of munitions and pointed out that monthly procurement deliveries had declined since November 1943. He also referred to a growing backlog of equipment to be repaired, and the need to speed up the settlement of terminated contracts and to increase work efficiency. He concluded: "The Army Service Forces have discharged their duties in exemplary fashion. They now face the task of meeting these additional and heavy burdens, and the accompanying exacting requirements for speed and accuracy, with the same determination, vigor and freshness with which lesser tasks were met and disposed of during the earlier months of the war. This is the homestretch in our race to defeat Germany and speed and stamina are demanded on every hand." divisions.17 Urgency had been dramatized. No doubt there were times when to some this sense of urgency seemed closely akin to ruthlessness. There were times when Somervell seemed insensitive to considerations of personal prestige or dignity Mr. Nelson of the WPB no doubt felt so on occasion. So probably did chiefs of the technical services within the ASF. Yet the fact remains that, to a remarkable degree, General Somervell, through the driving force of his personality, succeeded in transmitting a sense of urgency throughout the management and the operations of the Army Service Forces. It was one of his major accomplishments. General Somervell enjoyed the advantage of able assistants. The work of the ASF would never have been done otherwise. His chief of staff during most of the war was Lt. Gen. W. D. Styer, a fellow Engineer officer who had graduated from the U.S. Military Academy a year after Somervell. General Styer came from an old Army family, and his father had been an outstanding officer. In personal appearance and in temperament, Styer was the antithesis of General Somervell. The commanding general was of medium build, wiry, quick-moving, full of nervous energy, incisive, at times, impulsive. His chief of staff was taller and heavy-set, rather slow-moving, somewhat easy-going in disposition, always even-tempered, calm. He was a born negotiator and never believed in extreme positions on any subject. In some ways the two must have seemed a peculiar team, so different were they in appearance and disposition. But they made a perfect combination. Each had the greatest respect for the other. Somervell knew and appreciated General Styer's abilities. He learned to rely upon his skill in calming troubled waters. In turn, General Styer was loyal to his chief and sought faithfully to carry out his orders. As ASF chief of staff, General Styer was conversant with all matters which came to Somervell's attention. When Somervell was out of the country or on an inspection trip in the United States, Styer commanded in his absence. Many items coming to the commanding general's office were handled directly by General Styer. Thus, when the Office of Price Administration complained to the Under Secretary of War about excess Army issue of rationed gasoline, General Styer looked into the matter and arranged a mutually satisfactory adjustment for the two agencies. Many matters involving research and development, and especially relations with the Office of Scientific Research and Development, were handled by Styer without prior consultation with Somervell. The commanding general also asked his chief of staff to take care of other matters. When Mayor LaGuardia, remembering the Black Tom explosion in World War II, raised the question of the threat to downtown Manhattan through Army loading of ammunition at Caven Point on the Jersey side of the port, General Styer took up the matter with all interested groups and arranged to shift some of the loading to Navy facilities in the lower harbor. through the National Guard, and remained in the Regular Army as an Artillery officer. He came to the War Department General Staff after the Louisiana maneuvers in 1941. Always diffident in manner, hard-working, reliable, General Lutes was the "ideal staff officer" in Somervell's judgment. General Clay was another Engineer officer whom Somervell had known since West Point days. General Somervell brought him into G-4 from construction activities, and selected him to direct procurement activities for the ASE Clay was another hard-working officer, and like General Somervell, intense, quick, full of nervous energy. When Clay went to the Office of War Mobilization and Reconversion in the autumn of 1944, his successor was Mr. Howard Bruce, Baltimore businessman and chairman of the board of the Worthington Pump Company. Mr. Bruce had been a leading figure in the ASF since the beginning, one of a number of businessmen brought in by General Somervell. Other prominent staff officers on procurement matters were Maj. Gen. W. H. Harrison, formerly vice-president of the American Telephone and Telegraph Company; Brig. Gen. Frank R. Denton, a Pittsburgh businessman; Brig. Gen. A. J. Browning, formerly president of the United Wall Paper Factories, Inc.; Col. Fred C. Foy, of a large New York advertising firm; Mr. W. C. Marbury, a prominent Baltimore lawyer; Mr. Joseph M. Dodge, president of a Detroit bank; and Col. Maurice Hirsch, prominent Houston lawyer. Every one of these men was a civilian, serving as such or as an officer commissioned in the Army of the United States. Indeed, there were more temporarily commissioned than Regular Army officers in the key positions of the ASF staff. These included Maj. Gen. F. H. Osborn, of a prominent New York family, who headed the Information and Education Division; Mr. James P. Mitchell and Col. Ralph F. Gow of the Industrial Personnel Division; and Col. A. B. Drake of the Storage Division; not to mention the many immediate associates of various division heads. In a few cases, graduates of the U.S. Military Academy who had left the Army for private enterprise returned to important positions in the ASE One of these was Maj. Gen. J. W. Byron, who became head of the Special Services Division running the Army's recreation and athletic program and the post exchanges. General Somervell felt that General Byron uniquely combined the qualities of a soldier and businessman and that his performance was exemplary. Others with a similar background were Maj. Gen. A. H. Carter, senior partner of Haskens and Sells, who became the ASF Fiscal Director, and Brig. Gen. C. E. Dissinger. Among the Regular Army officers whose performance on the ASF staff Somervell regarded as outstanding were Maj. Gen. C. F. Robinson; Maj. Gen. W. A. Wood, Jr.; Col. C. B. Magruder; Maj. Gen. Glen E. Edgerton; Maj. Gen. Myron C. Cramer; Maj. Gen. F. A. Heileman; Brig. Gen. Theodore M. Osborne; Brig. Gen. D. N. Houseman; Brig. Gen. Hugh C. Minton; and Maj, Gen. W. L. Weible. This list by no means exhausts all of the individuals who played a key role in ASF staff activities and who in various ways contributed so much to ASF performance. General Somervell took great pride in his associates, from staff directors and division heads to their many field grade and company grade subordinates. The chiefs of the technical services were all Regular Army officers, mainly men who had spent long years in their particular branch of service. Three of the seven were serving as chiefs when the ASF was created and remained until the end of the war: The (Quartermaster General, Lt. Gen. Edmund B. Gregory; the Chief of Engineers, Lt. Gen. Eugene Reybold; and the Chief of Chemical Warfare Service, Maj. Gen. William N. Porter. Three replacements were made during the war: Maj. Gen. Charles M. Wesson, Chief of Ordnance for four years, retired in June 1942 and was succeeded by Lt. Gen. L. H. Campbell, Jr. Maj. Gen. James C. Magee retired as The Surgeon General in 1943 and was followed by Maj. Gen. Norman T Kirk. Maj. Gen. Harry C. Ingles became Chief Signal Officer in 1943, succeeding Maj. Gen. Dawson Olmstead. General Somervell and General Marshall jointly selected the new chiefs of technical services, although considerable external pressure had to be met in the selection of a Surgeon General. The chief of the seventh technical service, Maj. Gen. C. P. Gross, head of the newly created Transportation Corps, was General Somervell's personal selection. As the war progressed, there was a big turnover in commanders of the service commands. A few of these were General Somervell's personal selection: Maj. Gen. Philip Hayes in the third; Maj. Gen. James L. Collins in the fifth; Maj. Gen. H. S. Aurand and later Maj. Gen. Russel B. Reynolds in the sixth; Maj. Gen. Clarence H. Danielson in the seventh; and Maj. Gen. David McCoach in the ninth. Two of the men whom the ASF inherited turned in especially outstanding performances Maj. Gen. Richard Donovan in the eighth and Maj. Gen. Frederick E. Uhl who served first in the seventh and then in the fourth. The service of Maj. Gen. Sherman Miles in the first and Maj. Gen. Thomas A. Terry in the second was also exemplary. The service commands tended to be the dumping ground for all the field grade officers whom the Army Ground Forces found unsatisfactory. This produced a difficult personnel situation and helped to explain why some of the technical services and perhaps even the Army Air Forces distrusted the service commands. General Somervell and the commanders of the service commands could only make the best of a troublesome situation. The basic principles underlying the whole scheme are to put more responsibility and authority in the field, and in the hands of the Service Command; to eliminate, insofar as possible, duplications which may exist between the work that is being done by you and by other agencies. We want to get away, as far as we can, from this motherly or fatherly attitude that has been adopted by Washington and to put not only these responsibilities squarely on your shoulders, but let you alone and let you do them. Next, we must not be satisfied until we have the best organization that there ever has been. The job is so big and so difficult and so tremendous and so widespread that nothing short of the best organization that has ever been on the face of this globe will do this job and do it right. Now, we have just got to get it and we will get it. I say what I say in all seriousness. I have no illusions about the size of the job that is ahead of us or the difficulty of getting the type of organization I am talking about. But this is not just talk. We will have to have it and we are going to get it. (5) constant assurance that the organizational arrangements in effect at any one time were producing results with the least possible expenditure of manpower and other resources. In one important respect Somervell's organizational thinking was formalistic; he made few allowances for the personality factors in group operations. He was inclined to believe that men work together in whatever patterns of work assignment are necessary to achieve maximum operating results. He was apt to ignore, or underestimate, the importance to many persons of tradition, prestige, need for recognition, and other such considerations. Circumstances compelled Somervell in 1943 to give more attention to the personal aspects of his relations with the chiefs of the technical services.24 In many informal ways he was able to build more co-operative relationships with these officers, but he could not help but regret that others did not share his own concept of organization as a formal rather than personal arrangement. Somervell endeavored continually to stress that the common element in the ASF was service, service to the overseas theater of operations and service to the AGF and AAF in the United States. To the individual units, such as the Office of the Chief of Ordnance, or the Office of the Chief of Finance, or Information and Education Division, service meant certain specific activities. To the Army Service Forces as a whole, service was everything necessary to support the combat commands of the Army everywhere. In various ways General Somervell sought to emphasize the unity of the ASK Immediately after its creation he initiated periodic conferences of his chief staff officers, and early in 1943 he brought into them the chiefs of technical services. These conferences continued on a twice-a-month basis until the autumn of 1945. Agenda were prepared in advance, and summary minutes were reproduced and distributed within twenty-four hours. 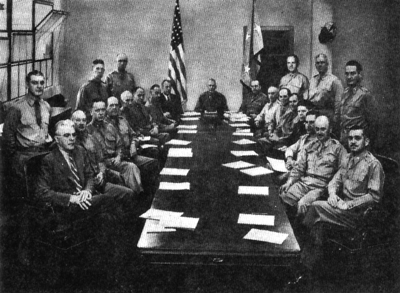 On these occasions various officers were requested to present problems of general interest, and each conference ended with a call around the table for any items of importance. Semiannual conferences were held for all commanding generals of service commands and their principal staff assistants. General Somervell missed only one of these and then because of absence from the country. Hq, SOS, June 1942. Seated left to right: Mr. A. R. Glancy, Chief of Production Br, Brig. Gens. James E. Wharton, Dir of MPD, H. S. Aurand, Dir of Intn Div, Charles Hines, Dir of Resources Div, C. D. Young, Dir of Production and Distribution Div, Maj. Gen. John P. Smith, Chief of Adm Svs, Brig. Gen. L. D. Clay, DCofS, Requirements and Resources, Hon. Robert P. Patterson, US W, Lt. Gen. B. B. Somervell, CG, ASE, Brig. Gens. W. D. Styer, Cof S, A SF, L. Lutes, Dir of OPD, Clarence R. Huebner, Dir of Tng Div, C. P. Gross, Chief of Trans Div, Mr. 1. P. Mitchell, Dir of Civilian Pers Div, Cols. F. A. Heileman, Chief of Distribution Br, A. Robert Ginsburgh, Chief of Public Relations Br. A. J. Browning, Chief of Purchases Br. Standing left to right: Cols. C. F. Robinson, Dir of CD, W. A. Wood, Jr., Dir of Requirements Div, Robinson E. Duff, Chief of Gen Depots Sv, Brig. Gen. A. H. Carter, Dir of Fiscal Div, Col. 1.N. Dalton, Chief of Adm Br, Capt. Harold K: Hastings, Aide to CG. can eat without the Quartermaster. The Ordnance Department cannot deliver ammunition to Italy without the Transportation Corps. No technical service or service command can secure men to train for overseas without The Adjutant General. We depend upon each other. We must pull together. In many activities, unified direction and uniform systems and methods are essential. Occasions demand that for the common good we bury honest differences of opinion, pride of sub-organization, of methods or systems, natural resentment against central direction. We must be loyal to each other, must move on a united front. Such an attitude must underlie all our thinking, all our actions. This particular talk was a kind of peace offering after the conflict of the preceding October over the internal organization of the ASK The existing pattern of duties had been established. But unity of purpose and effort was still essential. It now became the major theme within the ASF. Some progress in this direction had been made by the time the war ended, eighteen months later. But behind this quest for a sense of unity there was not the same urgency which marked the actual performance of the work of the ASE Unity remained a continuing but elusive aim for ASF management. It may help you a little bit if I made just a few observations. Colonel Johnston said in a small command the job of the Control Division would be done by the Commander himself. In a little larger command it might be shared by the Commander and the Chief of Staff. But when your show gets as big as the one you have here, you have to bring an additional person into the picture who does nothing but devote his whole time to keeping the elements before the Commander in such a way that he can keep his show under control. 1. Work Simplification (a formalized process for analyzing and simplifying both the processing of large-scale paper work and work-gang operations as in loading and storing supplies). 2. Work Measurement (a device for comparing workloads and manpower utilization among field offices performing a comparable task, such as supply depots). 3. Procedures Standardization (the development of simplified, standard, basic procedures for various types of work such as letting procurement contracts, the handling of supply requisitions from overseas theaters of operations, sales from post commissaries, classification of military personnel, maintaining depot inventory records, preparing bills of lading for supply shipment, and the separation of military personnel from service). tional "Service Record," the basic piece of paper showing an enlisted man's military career). 5. Centralization and Control of Publications (the number of Army field printing plants was reduced from seventy to thirty-five and costs of operation reduced 17 percent even in the face of a 20 percent increase in volume). The Control Division was organizationally and personally close to General Somervell. Its point of view was the ASF as a whole. It had no purpose except to help make Somervell's direction effective. The division helped other staff units do their work but never took over their jobs. It also tried in many ways to encourage the technical services and the service commands to develop control programs of their own. After the war had ended, the U.S. Bureau -of the Budget began to advocate throughout the entire federal administrative structure just the kind of work which the Control Division did within the ASE The work of the Control Division managed to survive in various parts of the Department of the Army and the national Military Establishment as well, which justifies the conclusion that the promotion of the concept of management improvement was not the least of General Somervell's wartime contributions. Admittedly, he was not alone in his thinking and action on this score but, of all contemporary administrators in the federal government, he probably made the most use of an institutionalized effort to achieve increased administrative efficiency in the performance of essential government operations. The internal personnel problems of the Army Service Forces during the war were not unique. But in two or three respects, the ASF did explore new phases of personnel management. A basic concern of the ASF throughout the war was effective utilization of personnel. There was no way for the ASF to escape the general manpower shortage within the United States during the war years. It had to compete with other employers, both military and civilian. Only by reducing its requirements, therefore, could it find enough persons to do its work. The top management of the Army Service Forces turned to manpower problems with a new urgency in the autumn of 1942. One influence was the known intention of Chairman Robert P. Ramspeck of the House Committee on the Civil Service to investigate the rapidly increasing employment of civilians in all government agencies, an inquiry which was eventually held in the spring of 1943. Another factor was growing external criticism about the projected size of the Army. It became clearly apparent that with all its substantive problems of production, raw materials control, transportation, supply distribution, and the like, the ASF could not afford to be indifferent to its own personnel management problem. 1. The establishment and maintenance of proper and mutually satisfactory working relationships among all employees and between employees and management is a fundamental requirement of successful operation. This is a prime responsibility of the chief executive and his subordinate supervisors in each organization. 2. It is the primary objective of personnel management to build up, develop, and maintain an adequate and effective employee work force which will completely fulfill the mission of the organization. This means specifically that action is directed toward placing each individual in that particular job for which he or she is best suited and providing a total work environment which will enable all employees to utilize their skills and abilities to the maximum and find sufficient satisfactions in their daily jobs to make them want to stay in the organization. remuneration, supervision, training and development of employees, and the maintenance of proper working conditions. The statement set forth a clear determination that "all employees will be fairly treated at all times and that those who believe they have been unfairly treated will be given the right and opportunity to discuss such matters with higher supervisors and executives." It then set forth general practices in presenting and adjusting employee grievances. On the subject of employee organization, the statement declared: "Employees are considered free to join or refrain from joining employee organizations or associations without interference, coercion, restraint, or fears of discrimination or reprisal because of such membership or non-membership." The right of employees to present matters for consideration individually or through representatives was recognized. These "principles and policies" remained the guiding canons of personnel management within the Army Service Forces throughout the war. They placed the ASF in the front ranks of government agencies with an "enlightened" personnel program. But important as these actions were, they were by no means the final solution to the central problems of personnel management in wartime. The basic issue continued to be numbers and utilization of manpower. A first need was for accurate, useful data on personnel strength. War Department military personnel reporting practices simply indicated the total military personnel under the jurisdiction of the ASF as of the date of a report. Total military personnel included men at induction stations and reception centers in the process of assignment, troops in staging areas and en route overseas, individuals and troop units being trained by the AST for duty with the ground forces of the AAF or an overseas command, and patients in hospitals. Immediately the ASF divided its military strength into two categories non-operating personnel and operating personnel. ASF internal management was concerned only with the second group, those who performed the activities of the ASE On 1 July 1942, for example, the total military strength of the ASF was 540,000, of whom only 252,000 officers and enlisted men were operating personnel. As of 31 July 1943 total military strength was 1,364,342, of whom 554,287 officers and enlisted men were operating personnel.37 The non-operating personnel were individuals in process of classification and assignment, receiving medical treatment, being transported overseas, or similarly under temporary ASF jurisdiction. the procurement and storage operations of the technical services. For this work the general practice was to use officers, mostly Reserve officers or individuals commissioned directly from civilian life, and civilians. Officers and enlisted men, however, were used extensively in the operation of military posts throughout the United States. The number of civilians in ASF operating jobs reached a peak of 1,023,000 in June 1943. Thereafter, the numbers steadily declined to 748,000 on 30 June 1945, a reduction of 25 percent.43 This reduction was not entirely voluntary on the part of the ASF. It was occasioned by growing manpower shortages throughout the United States and the preference of many workers for employment at other than military installations. Many posts were geographically removed from centers of population and provided few attractions for civilian employees. Wages in private industry, moreover, were frequently higher than pay rates on military posts. The ASF could have gone farther in replacing military personnel with civilians if the latter had been available at the places where needed. command realized that large-scale efforts would have to be launched to improve personnel efficiency. The Chief of Ordnance, on 3 November 1942, had issued a pamphlet for the guidance of his field installations entitled Program for the More Effective Utilization of Personnel. When this came to the attention of General Somervell, he had copies sent to the chiefs of the other technical services with the request that they develop comparable efforts. This was a beginning, but the methods were general and exhortative. Something more specific and more authoritative was required. 1. To develop and utilize adequate personnel data. 2. To establish an effective control over the numbers of personnel. 3. To replace certain types of personnel. 4. To expand, refine, and speed up the program for personnel management. 5. To eliminate all nonessential activities. 6. To improve the organizational structure. 7. To decentralize activities and authority to act to the greatest extent possible. 8. To increase the efficiency with which essential activities were performed. General Styer issued a series of directives to accomplish these purposes and an intensive drive began throughout the ASF to improve the utilization of personnel. 45 With varying degrees of intensity this drive continued throughout the war under the general oversight of the Control Division. major unit of the ASR Third, a single form was used to report personnel strength monthly, and to authorize personnel on a quarterly basis. At the beginning authorizations of personnel reflected the existing personnel strength, except that General Somervell insisted upon a total reduction of 105,000 persons which was distributed among all units in the authorization for the first quarter ending 30 August 1943. Thereafter, only in unusual circumstances were requests for increased strength approved. Thus, of one million civilians employed at this time, just 8 percent were engaged in general administration overhead, including service commands. Another 6.7 percent were in procurement offices, where there was a considerable volume of paper work. The great bulk, 85 percent, were employed as workers in arsenals and other manufacturing establishments, in the loading and storage of supplies at depots, in handling supplies at ports, in operating military posts (especially the storage, repair, utilities, and maintenance activities), and on construction projects. While this kind of reporting was never placed on a systematic basis in the ASF, it served to reveal the kind of work the bulk of ASF employees performed and where the largest savings in personnel might be realized. It was one reason why so much attention was given to improving all storage and warehouse activities. It is impossible here to cover all aspects of personnel management in the Army Service Forces. Considerable attention was given to officer classification and assignment, for instance. Great improvements were introduced in wage administration for civilian employees, and particular attention was given to employee training, and especially to the training of supervisors, all of which were important to ASF personnel management. The process of budget preparation within the ASF during World War II never served as an important technique of management for three reasons. In the first place, after Pearl Harbor, budget estimates were prepared upon the basis of planning documents fixing the size and organization of the Army, its prospective deployment, and the requirements of the Army Supply Program. Budget preparation consisted mainly in translating these decisions into cost estimates. Budgeting therefore tended to be a secondary and somewhat mechanical activity. In the second place, the appropriation structure for the War Department in World War II by no means reflected the administrative realities of war operations. Budget preparation was intended primarily to give the House Committee on Appropriations estimates in the form to which the committee was accustomed. The emphasis then was on the committee's attitude and not upon the management needs or possibilities of the Army Service Forces. There was no appropriation estimate for the ASF as such or for any of the broad phases of ASF activity such as procurement, storage and distribution of supplies, transportation, training, administrative services, or management expenses. These items entered into the preparation of appropriation estimates, to be sure, but they were not submitted separately. Instead, the estimate for Ordnance Service and Supplies, for example, included not just procurement and storage activities by the Chief of Ordnance in the United States, but estimates of local procurement and other local activities in overseas theaters which might be charged to this particular appropriation. Eight major appropriation titles (Finance Service, Ordnance Service and Supplies, Signal Service, Quartermaster Service, Transportation Service, Engineer Service, Medical and Hospital Department, and Chemical Warfare Service) in the War Department appropriation acts included not just ASF operating expenditures but Army-wide operating expenditures, although these estimates were presented by the ASF. But wartime appropriation estimates were not ASF management estimates, and so could not be used systematically to review the adequacy of internal ASF operations. In the third place, there were personality factors within the ASF fiscal machinery and in the War Department budget office which did little to encourage General Somervell to make extensive use of budget preparation as a tool of management information and direction. On one occasion General Somervell asked his own budget office to explore the possibility of an AST budget estimate which could be used for both internal management and appropriation purposes. He was subsequently informed that the budget officer of the War Department had made inquiries and reported general hostility to the idea on the part of the House Appropriations Committee. Thus rebuffed, and busy with other more pressing matters, Somervell let the matter drop. General Somervell, I have been a member of the Committee on Appropriations for 10 years and for 8 years I have been chairman of the subcommittee, and am also a member of the subcommittee on Deficiencies, which hears the representatives of practically all Government agencies. In spending its funds, the ASF did make use of fiscal control techniques for management purposes. Funds to be spent for printing and reproduction were limited in order to curtail activity. In addition, local purchasing funds to be used by posts, camps, and stations were carefully controlled, as were expenditures for repair of structures and for recreational activities for enlisted men. Accounting records were constantly used, moreover, to check the fidelity with which all financial transactions of the ASF were conducted. Indeed, the accounting improvements introduced by the ASF were numerous and extensive. the only authorized agency for handling Army publicity, and its efforts were concerned with the Army as a whole. Because of his position, General Somervell had to make numerous personal appearances at various gatherings. A few talks were made before business groups to whom Somervell invariably spoke on the importance of America's productive capacity in the conduct of the war.52 Occasionally there were talks to labor groups. ; the most notable of which was a great labor luncheon in Detroit on 4 July 1942. Personal appearances were also made on Memorial Day (Arlington National Cemetery, 30 May 1943), at an Army Day celebration (Mayflower Hotel, Washington, 6 April 1942), and at an Armistice Day observation (Pittsburgh, 11 November 1942). He often spoke at American Legion conventions, graduating exercises of officer candidates in ASF schools, and general hospitals. To the Women's National Advisory Council set up by the War Department Bureau of Public Relations, General Somervell appealed on 25 June 1943 for assistance in Army nurse and WAC recruiting. He also addressed the semiannual meeting of the Academy of Political Science in New York on 10 November 1942 (the request to appear coming from Lewis Douglas, then deputy administrator of War Shipping), and the New York Herald Tribune Forum on 16 October 1944. These public relations activities were in "the line of duty," and can be considered as required by his job as a top administrator of the War Department. He accepted them as such, without either particular enthusiasm or dislike. It was not the kind of activity which most interested him. We need more workers in our critical war programs and we need more production per man per hour from those workers already in our plants. We are losing thousands of war workers each month because they have come to the conclusion that it is time to move to a more permanent peacetime job before the collapse of our enemies. We know that in certain critical items such as tires we could get an immediate and significant production relief if the workers in the tire plants felt that the urgency of the situation was greater than their distaste for establishing high production records which might be used as a peacetime basis for negotiating labor rates. The basis of this public opinion is the fact that since Guadalcanal the daily news has been an almost constant repetition of good news, victories, spectacular bombings, enemy fleet losses and ground advances. And now a serious German thrust into our lines is keyed to the comparison of their last thrust in 1918 and is a "disastrous throw of the dice" for the Germans. All this is fine if we believe that there is little probability that we still face a tough bitter struggle with Germany of an unknown number of months of duration, followed by a longer and in some ways tougher struggle with Japan. Our people are more prosperous than ever before in their history. They have responded to the call for war production by longer hours, shift work, living in uncomfortable temporary housing and with numerous other sacrifices. They have never been bombed, they have little appreciation of the horrors of war and only in a small percentage of instances do they have enough hate, for that alone to act as a driving force. You hold me responsible for production. Our material requirements for ETO have been increased since last September. I have no mandatory authority by which I can command people to produce more. I can only get that production through leadership and a common understanding of our problems. As required General Somervell had his office prepare an annual report for each year of the war. The reports for the fiscal years 1944 and 1945 were summarized and distributed to the press. The annual report is a traditional government communications device, and the annual reports of the ASF were written to provide a broad survey of activity for the use of those who might be interested in the general problems encountered. In essence General Somervell's attitude toward public relations was quite clear. He fulfilled as best he could the "legitimate" public relations activities inherent in his job and scrupulously avoided all purely social gatherings, parties, and other such affairs throughout the war. He felt that he had one, or at most two, public messages to emphasize. First, he wanted workers, managers, and the public at large to understand the importance of supply in the military operations of World War II. Second, he wanted "efficiency" constantly held up as the goal of ASF operating methods; he hoped that the efficiency of Army Service Forces efforts would be "news." In this he was disappointed, and when it was all over he wondered what more might have been done to have made both aims more popular. friendly, they were not particularly close. On Congressional matters generally, it was the Secretary of War and the Chief of Staff who spoke for the War Department. The Legislative and Liaison Division, which maintained close relations with Congressional committees, was an instrument of the Department's chiefs. When the Army Service Forces was created, General Somervell inherited one type of Congressional relationship from the Office of the Under Secretary. As the head of statistical activities, Brig. Gen. L. P. Ayres began the practice of meeting periodically with the Senate and House Committees on Military Affairs to present data on procurement progress and certain other activities. For a time after June 1942 General Somervell continued the practice. The last such meeting was held in June 1944 when Somervell himself appeared to explain the supply details of the invasion of France to the Senate Committee on Military Affairs. There were various factors which tended to discourage these meetings. The two military affairs committees would not meet jointly, and so an appearance before one had to be counterbalanced with an appearance before the other. Moreover, Senators and Representatives were too busy with other activities to take much interest in the general administrative arrangements of the ASF as long as the desired results were forthcoming. Since the initiative for arranging these meetings came from within the War Department rather than from the committees, no complaints were received from the committee when the practice died out. From time to time tile ASF did arrange for members of important committees to visit near-by installations such as Ft. Belvoir and Aberdeen Proving Grounds. General Somervell twice directed a showing of new weapons at Ft. Myer for the information of the Secretary of War, the Chief of Staff, and Congressional leaders. the Army.55 On 17 December 1945 he urged defense unification before the Senate Committee on Military Affairs. Occasions such as these were rare. Formal legislative relations were neither an important or burdensome part of the work of the commanding general of the Army Service Forces. This suited General Somervell. I cannot agree, however, that the War Department failed to keep faith with the Congress of the United States with respect to the construction of this building. In the House hearings of my 22, 1941, I stated that the building could be built, on the then contemplated site, for $35,000,000 (exclusive of parking facilities). I pointed out that the Bureau of Public Roads had already prepared a general plan for the highway development from the south and west to the city of Washington and that the proposed building site would fit into that layout without difficulty. None of the costs of this general highway system was therefore included in the estimate. In the Senate hearings of August 8, 1941, I stated, with reference to the proposed change in location, "it is impossible for me to give you any accurate figures on the southern site." I further added that the costs would be considerably increased due to the additional roads and expensive foundation and grading requirements. You are, of course, aware that this change in site was made. per square-foot costs of the Pentagon Building. If we compare the cost of the building proper, $49,194,000, we find that that cost per square-foot gross is only $8.52, a figure comparable to that of other government buildings. Comparing the net costs, it is found that the Pentagon Building drops well below others. Representative Engel never succeeded in persuading any of his colleagues to join him in his charges; the Truman Committee later explored the project but soon dropped it.59 The House Committee on Appropriations never questioned the War Department's action, but the charges of wrong-doing were nevertheless repeated from time to time and were taken up by radio commentators generally hostile to the administration. For this reason, General Somervell had a complete brief prepared on the Pentagon project and left this in his official files as a statement of exactly what happened.60 It seems evident from this record that the House Appropriations Committee was kept fully informed by the War Department on Pentagon costs, that the intention to use funds from general construction appropriations was clearly indicated to the committee, and that the committee never questioned or objected to the procedure. Moreover, the continuing usefulness of the building during and after the war, and the advantages derived from its location outside the congested central area of Washington, were too apparent to arouse any real criticism. General Somervell was inclined to dismiss this matter as of little importance. Behind the charge was the fact that the Army had driven some hard bargains with real estate owners, and the owners were disgruntled by a failure to obtain larger sums of money. Originally, the owners had been eager to have their properties used by the Army because of the wartime curtailment of vacation travel. Later, they wanted more money or a return of their facilities. In any event, the committee did not charge that the War Department, through the ASF, had wasted funds or that Army officers had been engaged in collusion with hotel owners. Second, the Truman Committee looked somewhat askance upon the Alaska Highway project, and in a postwar report referred to that project as "in itself a dubious undertaking." 65 No formal hearings were ever held on the project, although one was threatened. General Somervell had a complete account of the entire undertaking prepared for use in case of an investigation.66 The role of the ASF, through the Chief of Engineers, was one of carrying out instructions which came from the War Department General Staff; the basic decision was made in the War Plans Division before 9 March 1942 and was approved by President Roosevelt. There was no indication that the performance of the ASF in carrying out this task had been less than exemplary. For the most part, the report of the Mead Committee on "Accumulation of Surpluses" commented on situations which were well known in ASF headquarters and to which continuing attention was being given. The committee found failures, "both avoidable and unavoidable," to forecast requirements correctly, failure to standardize specifications "more universally," duplication of procurement programs, inadequate inventory control, and establishment of stock levels that were too high. But it made no recommendations which had not already been considered by the ASF. The committee criticized the Army for "being very loathe to declare surpluses," but then commented, as noted above, about having to recall five-gallon gasoline cans previously declared surplus. When the committee declared: "A great deal more could be done, however, in centralizing control of procurement between branches within the War Department and bureaus within the Navy Department and more could be done toward centralizing procurement as between the War and Navy Departments," 68 General Somervell could only ruefully recall the reception given his 1943 plan to centralize ASF procurement and his unremitting effort to collaborate with the Navy. The committee did at least pat the ASF on the back, for "greater uniformity" in storage operations than obtained in the Navy, and for employing "modern warehousing equipment and modern warehousing methods." 69 But the committee was critical because the ASF measured efficiency in terms of tons handled per man-hour instead of dollar costs, and strongly criticized the management of the Engineer Section of the ASF general depot at Columbus, Ohio. Admitting that the ASF had become aware of the situation before the committee did and had taken steps to change it, the committee argued that "good controls would have disclosed the inefficiency of operations earlier, and less drastic action to correct it would have been required." 70 In conclusion, the committee acknowledged that the Army and Navy were making some efforts to improve supply practices but urged "intensification." 71 General Somervell felt that the report was deficient in ignoring the complexities of the problems discussed and misleading in omitting adequate reference to the unceasing administrative attention being given to them. Highway; (3) petroleum extraction from the Norman Wells fields in Northwest Territory, Canada, and pipeline connection to the refinery at Whitehorse; and (4) exploration for additional petroleum reserves in the Canadian Northwest. General Somervell explained that he made the decision to exploit local oil resources in Canada in April 1942 in an atmosphere of general gloom and military setback. Alaska was vital to American defense; an air route to Alaska had been started which needed oil supplies, and a highway had been authorized, principally to service the chain of airfields. The nation was short of tankers and the German submarine campaign was destroying American shipping off the American coast. The Navy said it could not guarantee to keep shipping lanes open. He reported the consideration given the matter, the various persons who advised him, and how he in turn had discussed the matter with General Marshall and the Operations Division of the War Department General Staff. He pointed out that he then had the matter presented to a War Council Meeting (where both Secretary Stimson and Under Secretary Patterson were present) on 11 May 1942. He added that, at this same time, he had approved a project to explore for oil in New Zealand.73 Second, General Somervell defended the feasibility of the project. He mentioned the various fear sin adequate supply, failure of oil to flow through pipes at low temperatures, paraffin content, construction obstacles-and how all of them had failed to materialize.74 Third, he insisted that the job had been done competently.75 The fourth question was whether the project should have been continued in the light of changed circumstances. Here General Somervell simply rested his case on the argument that the Joint Chiefs of Staff had reviewed the project and had decided "to continue the project as essential to the war effort." 76 He went on to comment about the national concern for petroleum supply as one element behind that decision. To halt the project would save the expenditure of about $10,000,000. General Somervell then turned to an explanation of the agreements with the oil companies, the contractors, and the Canadian Government.77 In answer to questions on the subject, General Somervell stated that had he known in 1942 that the project could not be finished until 1944, he "doubted" if he would have approved it. The project had not been pushed as hard as it might have been because the urgent need for it had diminished.78 Many of the essential papers on the project were published at the conclusion of the hearings. ministrator for War should have been consulted before the Canol project was undertaken, that the contracts with the Imperial Oil Company and the Canadian Government "were improvidently drawn," and that the War Department should review the project to decide whether it was worthwhile to complete it.80 The committee concluded "that the Canol project should not have been undertaken, and that it should have been abandoned when the difficulties were called to the attention of the War Department." 81 The committee declared that it believed in prompt action, even when subsequent events proved it unwise, but that in this instance, General Somervell acted "on the basis of a faulty and unnecessarily incomplete consideration of the project by himself and his subordinates and without consulting other governmental agencies and private concerns with oil experience." 82 Some newspaper and radio commentators repeated these criticisms widely for a protracted period of time. rying out not "his" project but one directed by higher authority. Somervell reacted to these criticisms with mixed sentiments. On the one hand he felt that the attack upon the Canol project was personal, inspired by some imagined affront to certain individual Senators.90 On the other, he felt relieved that this was the only important decision the committee could find to criticize in an activity as gigantic and complicated as the supply and service of the American Army in World War II. terested primarily in finding something to "pin" on him, and was not interested in criticizing other officials within the ASK It is, of course, difficult to determine the exact motivation of Congressional committee members, and those newspaper writers and radio commentators who exploit their inquiries. Whatever the motive Somervell believed much of the personal criticism arose because he had alienated an influential member of the Truman Committee by refusing to do him a favor when he was in direct charge of construction work. Undoubtedly Somervell was regarded by some congressmen as imperious, headstrong, and little inclined to consult or cooperate with them in the fulfillment of their duties. Indeed, he was disposed to stay as far away from Congress as possible. This attitude did not make for harmonious legislative relations, and it may have contributed to the vigorous criticism heaped on him, criticism which may have had some justification but which was certainly unrestrained in tone and greatly exaggerated in both press and radio. The experience left Somervell with a feeling of considerable bitterness. He was not the kind of person who could by temperament be philosophical about the price the public administrator pays for high office in our democracy. In evaluating the work of the ASF from 1942 to 1945, Somervell concluded that its major accomplishments were five in number. In the first place, the Army had been better supported than any previous American Army in history. Certainly the supply accomplishments of World War II contrasted vividly with the failures in the Civil War, the Spanish-American War, and World War I. As American production facilities reached a peak in turning out military items, and as shipping became increasingly available, military operations overseas were almost never seriously handicapped by a lack of supply. In the second place, the quality of weapons and of other equipment had not been sacrificed in order to obtain quantity. In the last half of 1942, for example, the medium tank model was completely changed even though some production loss was necessarily entailed. Heavier tanks and heavier tank weapons were also introduced. Combat clothing was almost completely redesigned as a result of experience gained in North Africa. Wherever improvements became possible or experience demonstrated new needs, the ASF went to work. In the third place, no substantiated charges of dishonesty were ever brought against any of the top staff of the ASK This was a tribute to the integrity of the thousands of men engaged in the supply task, and to the administrative machinery which provided a constant check on possible dishonesty. The few individuals who were detected profiting from war contracts were promptly prosecuted. In the fourth place, the Army Service Forces constantly strived for and attained increased efficiency in the performance of its work. Finally, the volume of ASF activity told its own story. An almost unheard-of expansion had to be undertaken in the supply and support operations of the American Army in World War II. Yet it was done, and done in a short period of time. This, after all is said and done, must stand as the real tribute to ASF management. would first of all have consulted more frequently with the G-4 Division of the WDGS, and would have used its influence in the General Staff to assist the ASF in the performance of its work. Second, he would have preferred more friendly relations with the WPB and with Mr. Nelson in particular. If the press of events had permitted more personal contact, Somervell believed that the bitter disputes that developed might have been avoided. Third, he felt that more attention should have been given to the attitudes and aspirations of the chiefs of the technical services. Finally, Somervell believed he should have worked more closely with various Congressional leaders. These were the principal management failures of the Army Service Forces, failures that were destined to influence the postwar organization of the Army. Somervell in the end discovered that vigorous internal leadership was not enough. External reputation was equally vital.